Hello out there. We’ve had a lot going on so I haven’t had a chance to post in awhile. I’ve been staying late at the school almost every day as well, helping out with various functions and programs going on. A student got caught with marijuana at school the other day, and it made me think a lot about the status of marijuana in our country. Now, before I go on about how I feel that it should be legalized, don’t mistake that for me thinking it’s okay for a high school student to be using it, much less bringing it to school. First of all, I’ve smoked marijuana numerous times in my life. As I’ve gotten older, I just don’t seem to care for it anymore. I do feel like it has many benefits, though, especially for people who suffer from different illnesses such as cancer. Even if someone has not been diagnosed with a disease, I feel like marijuana has benefits for a lot of different types of people. It helps people loosen up and relax, and gives them a couple of hours where they don’t really have to worry about all the important aspects of life. For people who are sick, it can help alleviate pain, increase appetites, and help with anxiety, not to mention that it has caused cancer cells to shrink and die. Marijuana is a plant that can be grown almost anywhere. Why does the government feel that they can control the growth and use of a plant? Ha. Dumb question. Why do they put it in the same class of drugs as cocaine or heroin though? Yeah, it makes your reaction time slower and it makes your mind open to other things, but marijuana is nowhere near as intense or dangerous as some of the other drugs in its class. 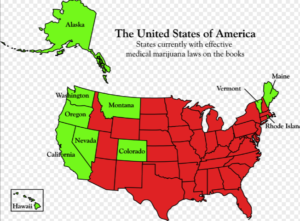 I know in the past few years that several states have legalized the drug, either for medicinal or recreational purposes, but why won’t the entire country get on board? Our country is spending millions of dollars on drug enforcement, when we could be making billions of dollars if they legalized marijuana and taxed it like they do with alcohol. I just don’t follow the logic on this matter. What do you guys think?